"What really makes the Monaco stand out, however, is the 400mm [15.7"] fingerboard radius. That’s shredder-friendly ‘Super Strat’ territory. You get a low action with easy string bending that is to die for." Hamer Guitars are back in the UK. The new Hamer Monaco is a new take on a classic and much-loved Hamer model. It is reviewed in the latest issue of Total Guitar magazine where it receives the magazine’s “Best For Shredders” award. "...you get a beautiful ebony ’board on the Monaco. The eye candy continues with the luxurious looking ‘Split-Crown’ inlays and the flame maple veneer top." "The generous C neck profile is a classic Hamer design. What really makes the Monaco stand out, however, is the 400mm [15.7”] fingerboard radius. That’s shredder-friendly ‘Super Strat’ territory. You get a low action with easy string bending that is to die for. Okay, we appreciate that radius won’t please everyone but it’s something you have to try before you make your mind up which guitar you want to buy." "...the fleet of fingers will lap it up." 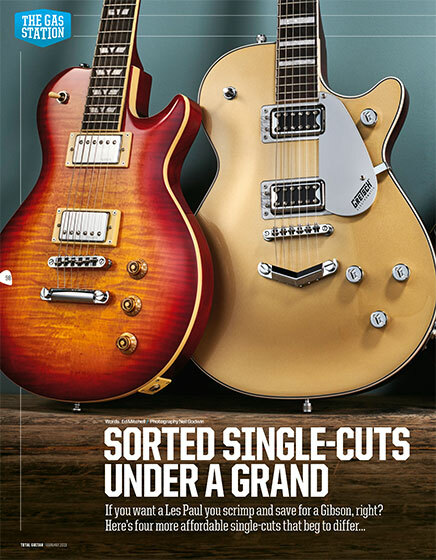 The full review can be found in the February 2019 issue of Total Guitar magazine or by clicking here. The Hamer Monaco is available now priced at £799 RRP inc VAT. The Monaco is a comfortable carved top single cutaway design built with a solid Maple cap on Mahogany and a set neck for great tone. The MONF-CS is visually stunning with a Cherry Sunburst Figured Maple veneer and it features a smooth playing mahogany set-neck and a Rosewood fingerboard that is capped off with classy victory inlays.